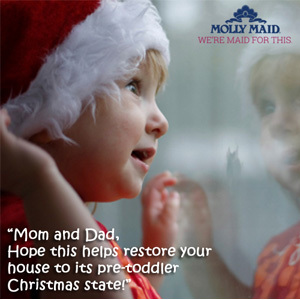 Each holiday season, our team sees tremendous interest in Molly Maid gift certificates for our professional, housecleaning service. 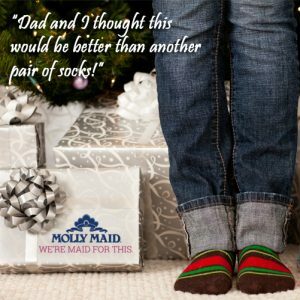 The comments submitted by gift certificate purchasers range from hilarious to heartwarming and everything in between. This year, we used these notes as inspiration for images posted on our Facebook and Twitter pages to celebrate the true meaning of giving someone special the gift of time. If you don’t already – follow our social media channels to receive helpful cleaning tips and stay connected for future promotions and giveaways! The sweepstakes Terms and Conditions are posted on our blog. Enter today and best wishes for a wonderful December! May your month and year ahead be filled with happiness and time to enjoy what matters most!